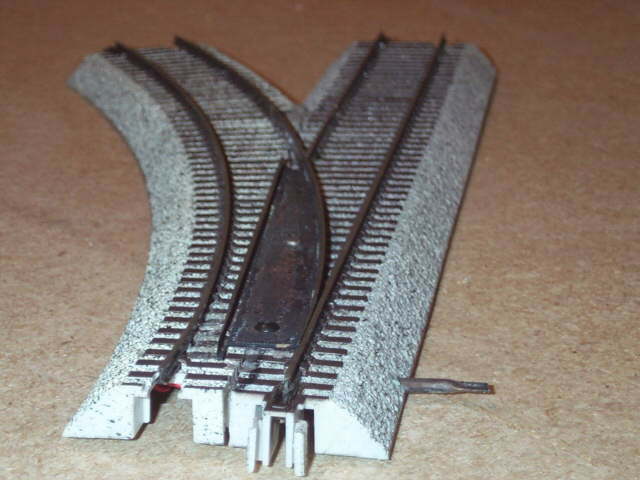 SUMMARY: This web page decribes some custom-made, closed-frog S-gauge switches, built from S-Helper Service S-Trax track by Mark Mogil, working with supervision from "the Gibbstown wizard", Chick Viggianno of Chick's Hobby Center in Gibbstown, New Jersey. 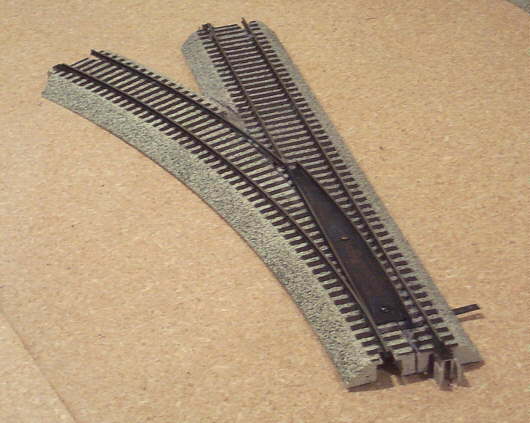 Note that Mark has done this by combining a piece of straight S-Trax with a piece of curved S-Trax. In other words, he does not begin with a switch. 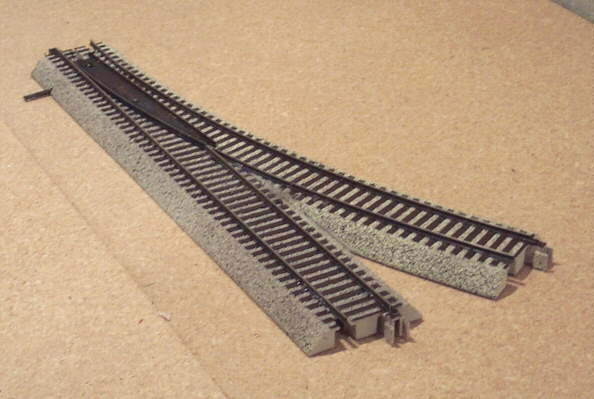 He begins with two pieces of plain track, and "kitbashes" them into a switch. Please note that Mark and Chick are NOT selling or marketing these switches. They are making just a few for their own use. Currently (Aug 2000) there is one of them on display in Chick's store you can inspect, if you're in the Gibbstown area. 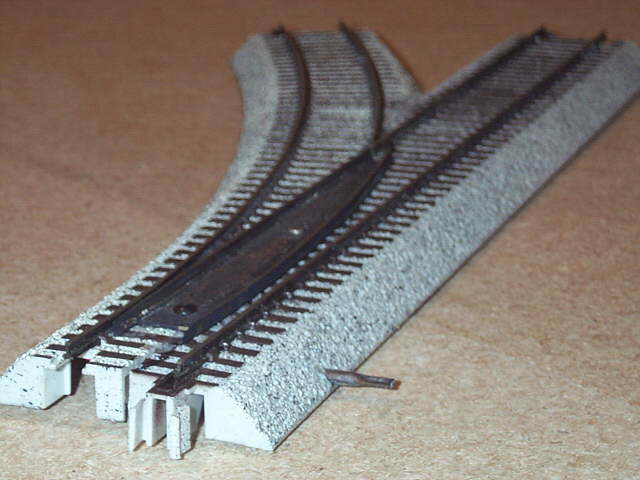 Editorial Comment--This is the switch that some of us S-Trax fans wish that S-Helper would have built, so that we who want to do public displays, instead of fighting over whether the switches are going to be scale or hi-rail, could use one style of closed-frog switch and run anything. 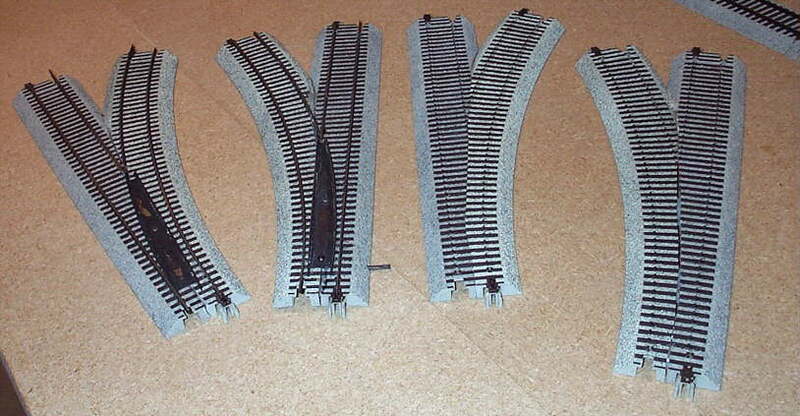 As you can see, only two of the turnouts have finished track work, and only one has a throw mechanism. Counting the one you saw a Chick's Hobby Center, there are only three closed frog, S-Trax turnouts in the whole universe. Worse yet, there are only two more presently in the works. The good news is that the finished turnout works! 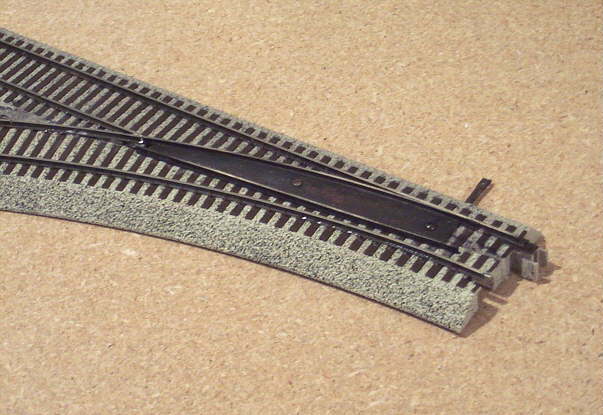 An American Models Pacific 4-6-2 with scale wheels ran through the turnout flawlessly in both directions. But most importantly, it was pulling two SHS box cars withthe stock hi-rail wheels. This first batch of turnouts took Chick and me about 20 hours. 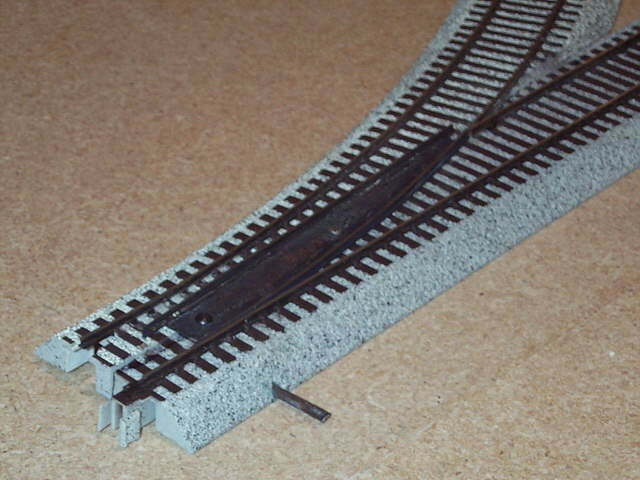 Obviously, the most difficult task is fabricating the moving track work. It requires cutting a brass plate, and soldering rail on its edge. 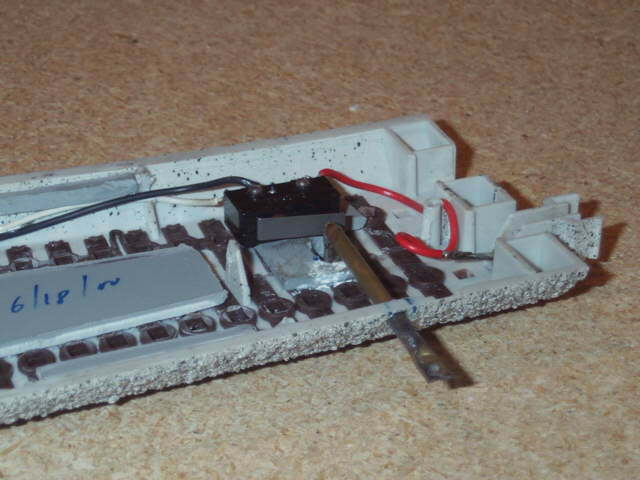 The soldering was the really hard part, but after a considerable period of trial and error, and error, Chick found a soldering technique that worked pretty well. I would consider this project to be a labor of love, as any hobby should be. 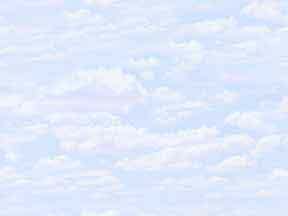 Please feel free to use this idea, photos, etc., for the benefit of S-Gaugers. However, since Chick and I spent quite a few hours on this concept, please credit us if you distribute these pictures.